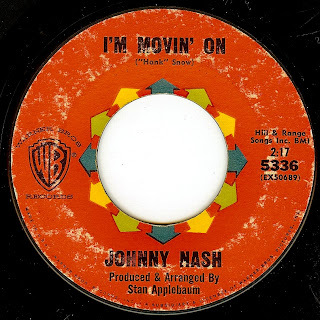 "I'm Movin' On" was originally written an recorded by country artist Hank Snow in 1950; Hank's original version was a straight blues but performed in a style that was far more western swing than the all and out R&B raver that we hear here. Ray Charles revived the number in 1959, and I would venture to guess that Johnny Nash's version was based on Brother Ray's. Johnny Nash had an interesting career; he started out as a teen idol in the late '50's (and was often paired up with Paul Anka), and saw a comeback in the early '70's when he famously incorporated reggae into his sound. The period in-between (such as this record) realized some great soul singles that never became the hits they deserved to be; specifically this one and 'Love Ain't Nothin'" (a past 45 of the day).